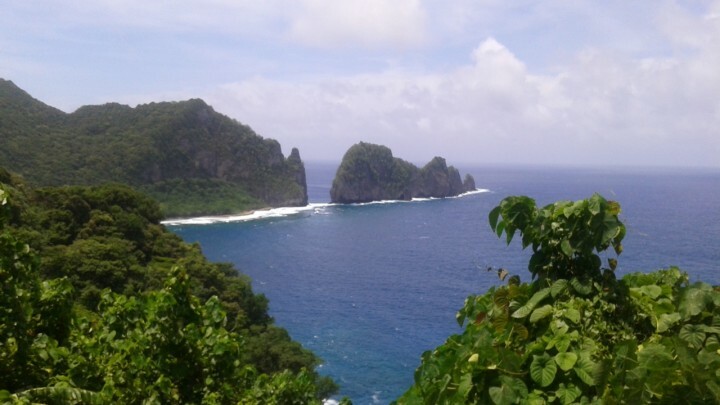 In late January and early February, some PICCC team members traveled to the Commonwealth of the Northern Marianas Islands, Guam, and American Samoa in order to engage local resource managers in cross-sectoral coordination dialogues about climate change adaptation strategies and opportunities. Within each Territory, workshops provided an overview of current climate hazards facing islands, future projections of climate change, and the strategies for improving adaptive capacity in the face of vulnerability and sensitivity. 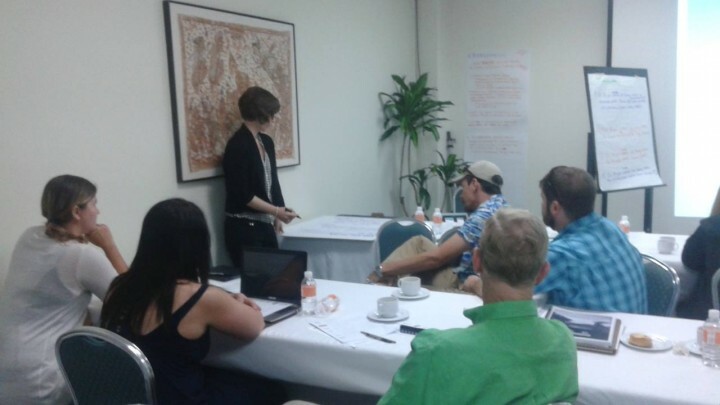 After hearing an overview of climate change projections and vulnerability assessments, workshop participants were divided into smaller groups in order to identify the impacts of greatest concern for managers on both an individual level and an agency/departmental level. 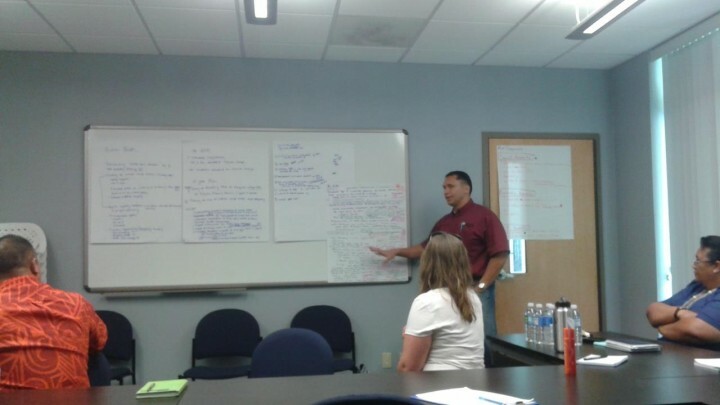 A small group in American Samoa brainstorms the major climate change impacts to the Territory. 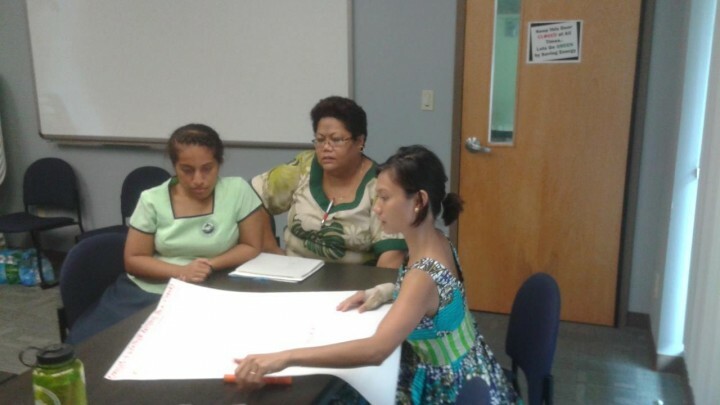 A small group identified the greatest impacts of concern to the CNMI from sea level rise. The dots in yellow and blue represent agency and departmental concerns, while the red dots denote personal concerns. 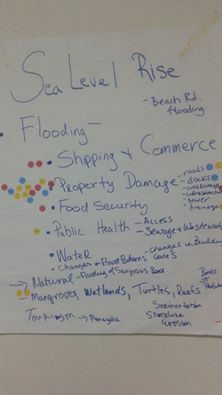 After identifying the impacts of greatest concern, participants in each jurisdiction were then able to self-select into focused groups (including community health and well-being, infrastructure, and ecosystem management) that developed long-term, 15-year goals for climate change adaptation. These goals were developed to be SMART: Specific, Measurable, Attainable, Relevant, and Time-Bound. Once these objectives were developed, the groups identified the technical capacity, projects, funding opportunities, and relevant data and information that the jurisdictions currently have that will help to achieve the objectives over the course of 15 years. American Samoa’s Forestry, Water and Agriculture subcommittee presents their 15 year SMART objectives. Guam’s Food and Water Security group identifies the current capacity and funding opportunities to achieve one of their long-term objectives. Once the groups established current capacity and opportunities to achieve those long-term goals and objectives, they then identified any needs and gaps that were not currently fulfilled within the jurisdiction. 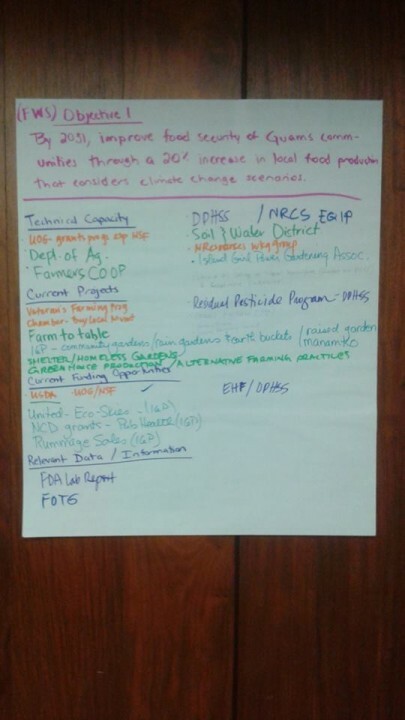 Using these needs, each group was then asked to develop near- term projects that would enhance resilience and put the jurisdictions on the path toward their long-term adaptation goals. The Ecosystems group in CNMI identifies multiple near-term projects that can achieve long-term objectives. 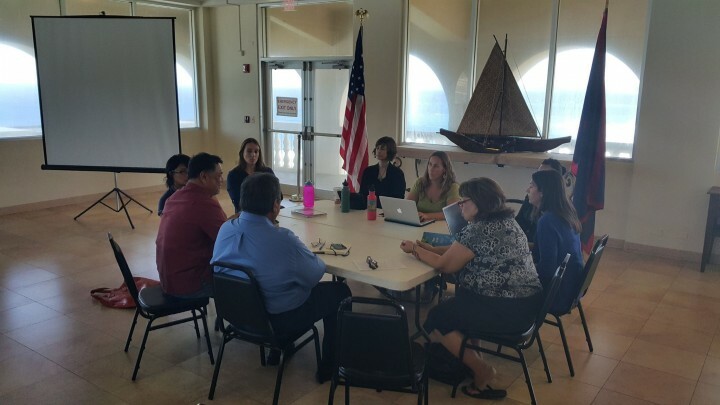 A small group in Guam identifies projects related to the vital needs of data development/management and climate migration. Finally, the PICCC team had the opportunity to see some of the beautiful landscapes and seascapes in each jurisdiction, as well as some locations where environmental threats are already being felt. 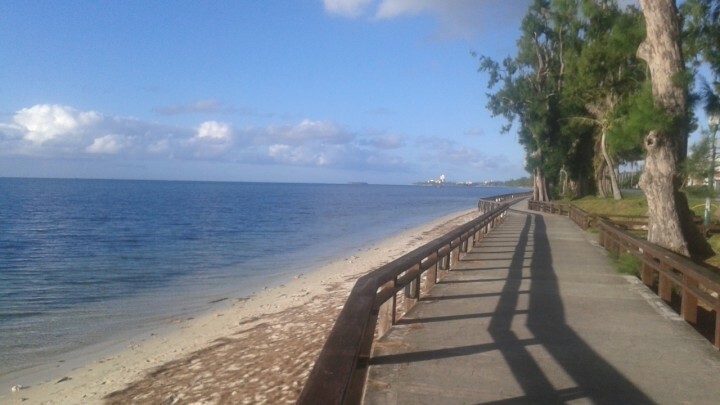 The walkway along Beach Road in Garapan, CNMI. 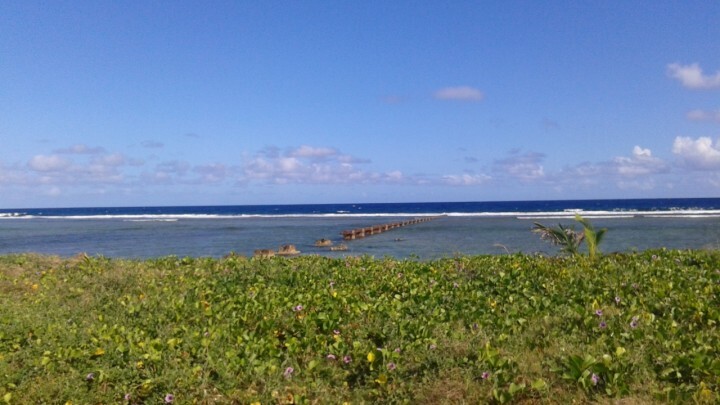 The view from the Asan Beach “War in the Pacific” National Historic Park in Guam. A view of Pola Island in the National Park of American Samoa. 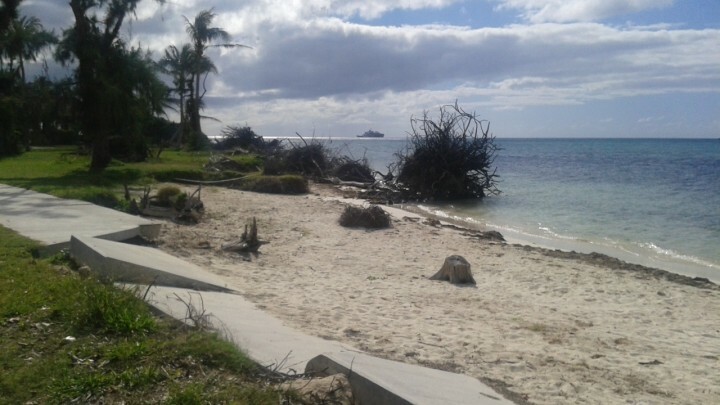 A view of broken sidewalk along the shoreline in CNMI gives us a sneak peek of the potential impact of sea level rise in the future.